Hey everyone! Sally here with the Henry B Plant Museum! On Sunday, February 20th, a complimentary tour (with regular admission) of the Museum will occur. At 1 pm, Cindy Xenick, a Museum docent, will lead a 35-40 minute tour of the Museum. Immediately afterwards, Curator of Education, Heather Trubee Brown, will make a 5-10 minute presentation on Thomas Edison light bulbs. At 2 pm, Upstairs/Downstairs at the Tampa Bay Hotel will feature Otis Freedman, Headwaiter, 1905. This 30-minute live theater performance showcases Otis as the professional black man of the era. He knows the “downstairs” viewpoint of the social goings on at the Tampa Bay Hotel from a behind-the-scenes perspective. He knows how polite society should behave; not every member can pass his “soup test.” Otis is a self-educated, intelligent man who knows the confinements of his station in life. Upstairs/Downstairs is also complimentary with regular admission of the Museum. The Henry B. 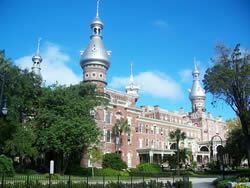 Plant Museum interprets the turn-of-the-century Tampa Bay Hotel and the lifestyles of America’s Gilded Age. Critical to the success of this mission is the restoration and preservation of this National Historic Landmark, an opulent 1891 railroad resort, and the artifacts significant to its history, and the life and work of Henry Bradley Plant. That&apos;s all for now folks, but stay tuned in for more updates on arts and culture in Tampa Bay!